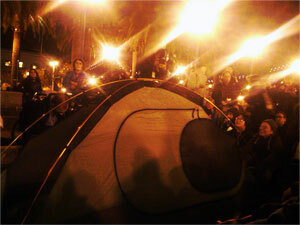 One of the first tents to be set up following the return of occupiers to Justin Herman Plaza, Dec. 7, 2011. The Dec. 7 police raid is only the latest of a series of attack on the camp. On the afternoon of Dec. 1, the SFPD set up barricades around Justin Herman Plaza signaling a possible raid. Protesters responded by occupying Market Street, the main thoroughfare through downtown San Francisco. The cops, diverted to Market Street, made it possible for some of the occupiers to take down the barricades, some of which were turned into a sculpture in the middle of the encampment. Police gratuitously injured one woman that day, leaving her with an open knee wound that required stitching at the hospital. The early morning of Dec. 7 was cold, in the low 40s. By one o'clock in the morning, there were very few people out on the streets. The police used this opportunity to assemble a relatively small but well-armed force surrounding the camp. They warned protesters that they had only five minutes to clear all of their possessions from Justin Herman Plaza or they would be arrested. Many in the camp, instead of removing their belongings, began occupying Market Street. The cops turned to a tactic known as kettling, surrounding the protesters on Market Street until they arrested them one by one. Seventy protesters were arrested, including one man who was run over by a police motorcycle and hauled off to jail after receiving brief and insufficient care at a hospital. The cops stated they will keep the protesters tents as “evidence.” One 51-year-old occupier claims the raid left him without his medicine and social security documents. By noon, Justin Herman Plaza, cleared of protesters, had been completely surrounded by cops in riot gear. Signs proclaimed that the park was closed to the public “for renovations,” even though anyone present could see that the plaza had been left spotless by the occupiers. At 12:30 p.m., an emergency general assembly was held at the intersection of Market and Spear streets. The ANSWER Coalition provided the sound system for the emergency action. At 1:30 p.m., the crowd marched to Justin Herman Plaza to confront the cops who had invaded their encampment. The cops would run, in unison to block entry to the plaza at any one point the marchers approached. One of the pretexts fabricated by police to forcibly evict Occupy camps is that the camps were unsanitary, yet large piles of excrement from police horses were on the ground. The crowd ordered the indifferent cops to clean up after their animals. Several hundred people, including this reporter, returned at 6 p.m. Occupiers marched from the Federal Reserve building to Justin Herman Plaza. The crowd re-entered the park with ease despite the police presence, but cops rushed in pushing people out of the park and onto the sidewalk. The police surrounded the plaza and the few occupiers who managed to hold their ground. The rest of the protesters in turn surrounded the cops, locking arms to form a human fence around the police. At about 7 p.m., a young African American man stood between the human fence and the cops and held up a cardboard sign comparing the controversial bill SB 1867, which would indefinitely suspend habeas corpus, to the police state envisioned in George Orwell's “1984.” Ironically, two cops emerged from behind the others to drag him down three concrete steps. They handcuffed him and stripped him of his jacket, although the temperature was in the 40s. He lay there weeping in pain, his face down in the dirt, as cops stood over him laughing. Although the brutalized man was heard crying, “I can't take the pain!” the cops would not call an ambulance and even refused to let a long-time occupier who is also a registered nurse attend to him. Eventually, a PSL member took the mic and demanded that the cops provide him with care, reminding them that the whole crowd knew the names and badge numbers of the cops who had assaulted the man. Thirty minutes later, an ambulance finally arrived, though in a bizarre move, the cops initially refused to let even the San Francisco Fire Department through to attend to the injured man. The cops told the crowd that while, they claimed, they had the right to arrest them all, they would arrest no one if everyone left immediately. The crowd rejected this “offer” and decided to hold a General Assembly next to the surrounded plaza. As the crowd began peacefully moving to the cop-free northern portion of the park, the police attacked another man, dragging him past the police line. A battalion of motorcycle cops drove into the northern portion of the park and appeared ready to charge the crowd. In response to these provocations, a group of the occupiers confiscated the cops’ barricades and set them up in front of the motorcycle battalion. This clearly rattled the cops, who then drove off on their bikes. The crowd was now empowered and they started charging the Plaza in great numbers. The cops made a full retreat. The camp was retaken, tents were set up, and a long and jubilant General Assembly was held. For the time being, at least, Justin Herman Plaza is ruled by the 99%, not the police apparatus of the 1%.